Ukraine's new president could regain control over the separatist-controlled east of his country within months and get cheap gas and major investment from Russia if he repairs ties with Moscow, the Kremlin's closest ally in Ukraine said.Viktor Medvedchuk, a prominent figure in Ukraine's Russia-leaning opposition, outlined the prospect in an interview before a presidential election runoff in Ukraine on Sunday which polls show political novice Volodymyr Zelenskiy should easily win. He said the Kremlin was keen to know more about Zelenskiy, a 41-year-old Russian-speaking TV comedian who has no political experience, to understand if he is someone it could do a deal with, something it failed to do with incumbent Petro Poroshenko who polls show will be soundly defeated by Zelenskiy. "They don't have any expectations in Moscow," he said. "They want to see what happens afterwards, who will be in his (Zelenskiy's) entourage, and what he will do and with whom." A Ukrainian citizen, Medvedchuk does not represent Russia, but his words carry weight due to his close friendship with President Vladimir Putin and track record as a go-between between the two nations. Medvedchuk said he had known Putin for 19 years, that the Russian leader is godfather to his daughter, and that he had held talks with Putin in Moscow as recently as two weeks ago. The Kremlin has made clear it will be glad to see the back of Poroshenko but has not commented on Zelenskiy, saying only that it is watching candidates' statements closely and hopes any new president can implement a peace deal on Donbass, eastern Ukraine, which has been under separatist control since 2014. When asked about Medvedchuk's advice for Ukraine's new president on Friday, Dmitry Peskov, a spokesman for Putin, said he greatly respected Medvedchuk, calling him "very active" and "important" when it came to his humanitarian work as an intermediary between Moscow and Kiev. Peskov, who confirmed Medvedchuk's recent meeting with Putin, said Ukraine didn't need to strike a specific deal with Putin or Moscow, but did need take steps to build mutually beneficial relations with Russia. Medvedchuk has brokered prisoner exchanges between Russia and Ukraine and held talks in Moscow last month with Prime Minister Dmitry Medvedev about gas prices. At that meeting, he said he and an ally secured a pledge of a 25 percent discount for Russian gas if Kiev agreed to resume direct gas purchases from energy giant Gazprom instead of via European countries as it has done since the end of 2015. Russia's main focus is returning separatist-held Donbass to Kiev on its own terms. This could help Moscow win some relief from sanctions imposed by the European Union over its 2014 annexation of Crimea and its backing for the pro-Russian Donbass uprising. Poroshenko, Ukrainian president for the last five years, balked at what he saw as the unfavorable terms of the so far unimplemented Minsk peace deal agreed at a 2015 summit with Russia, France and Germany. That called for Donbass to be given a special status and for an amnesty for separatist fighters among other things. So far, Zelenskiy has said he wants peace in the east and to breathe new life into stalled talks. But he has also said he does not want to implement parts of the Minsk deal either, that Putin should be regarded as "an enemy," and that an information war may be needed to try to win the hearts and minds of people living in Donbass. For now, said Medvedchuk, Zelenskiy was on the wrong policy track. But he said there was hope he might alter his stance once elected. "Maybe he'll come round to the idea that for the sake of peace you need to do this," said Medvedchuk. "Nobody is talking about having to make concessions or give something back. We're talking about the need to return people and territory." Putin might be willing to release 24 captured Ukrainian sailors as a goodwill gesture, Medvedchuk said, adding that billions of dollars of Russian money would flow into Ukraine's economy if economic ties between the two neighbors, which have been disrupted by sanctions, were restored. "We're not saying that we have to kiss or hug each other again. We're talking about restoring pragmatic economic relations," he said, adding that Ukraine had lost $20 billion a year in exports to Russia because of Kiev turning its back on Moscow after Russia's actions in 2014. An agreement on how to implement a peace deal over eastern Ukraine could be reached "within several months" and implemented on the ground within "six to eight months," said Medvedchuk, saying any talks on the matter should be between Kiev, Moscow and the two pro-Russian separatist breakaway territories. "We could do it all within a few months. We need to sit down and talk. It (the detail in the Minsk accord) has already been spelt out. We just need to determine the order of doing things." Medvedchuk said he would advise Zelenskiy on the subject if asked and that his party, "Opposition Platform - For Life", which is second in the polls, -- would potentially be ready to cooperate with Zelenskiy in parliament after elections in October on a case-by-case basis. Zelenskiy has indicated he would not want to form a coalition with Medvedchuk's party and has not said if he would be ready to work together on an ad hoc basis. Cold economic logic now dictated the need for a rapprochement with Moscow, said Medvedchuk. "If we don't do it and continue with this anti-Russian policy and hysteria our economic life will deteriorate further." 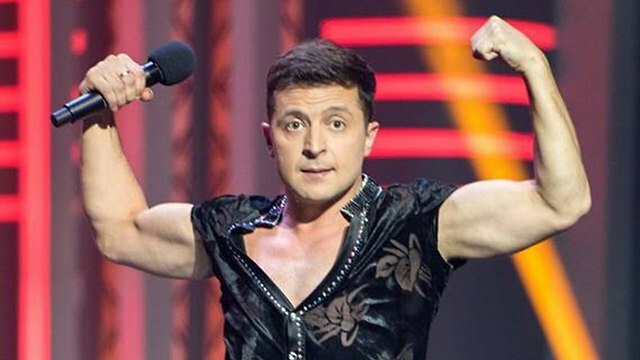 Ukrainian comedian Volodymyr Zelensky has won a run-off election to become the country's next president, exit polls suggest. Ukraine's president holds significant powers over the security, defence and foreign policy of the country. After voting on Sunday, Mr Zelensky said: "Today it will be the victory of Ukrainians, the victory of Ukraine, and - I hope - the victory of a fair choice." If polls are correct he will be elected for a five-year term. The 41-year-old is best known for starring in a political satirical drama in which his character accidentally becomes Ukrainian president. This seems to be bigger historic landmark than MAGA election. US had elected another TV actor before, Reagan (who unfortunately may go down in history as the worst POTUS). Reagan (who unfortunately may go down in history as the worst POTUS). Not even close even though Shrub Sr. did take control of most of his presidency. Vladimir Putin has refused to congratulate Ukrainian president-elect Volodymyr Zelensky on his landslide election. Speaking with journalists on Monday afternoon, nearly a day after the comedian romped home with 73 per cent of the vote, Kremlin spokesperson Dmitry Peskov said it was “too early” to talk about a phone call to Kiev. Russia would only open the doors of cooperation after judging “concrete actions” of the new president. Mr Peskov was referring to the estimated populations living in eastern Ukraine’s conflict zone and under the control of Russian-backed armed formations. In total, nearly 20 million voters took part in Sunday’s vote, with a higher-than-expected turnout at 63 per cent. International observers have described the elections as the cleanest in Ukraine’s history, with only minor violations recorded. Earlier, the Russian prime minister Dmitry Medvedev warned against expecting an immediate warming of relations. Writing on social media, he said the election of Mr Zelensky was an indication that Ukrainians wanted to take a “common sense” attitude to relations with Russia. But he added that improving cooperation required “honesty and a pragmatic and responsible approach”. Over the course of a minimalist election campaign, Mr Zelensky offered few clues about his political thinking. But one area where he has been outspoken has been his explicit rejection of the soft ethnic-nationalism pursued by his opponent. Instead, the populist candidate has offered olive branches to the Russian-speaking populations of the southeast. He also suggested that Ukraine needed to be more sympathetic to the people living in the conflict zone in the east. That approach seems to have helped him to achieve what no previous president has achieved: transcend traditional voting patterns split east-west on language and identity lines. With Zelenskiy's victory now all but official, the question shifts to how he will reshape Ukrainian policy after he takes office. In the short term, he won't be able to do much. The Ukrainian parliament, currently led by the Petro Poroshenko Bloc, presents a significant limiter on the power of the presidency. Therefore, Zelenskiy — whose party currently has no parliamentary representation — will find it difficult to push through any significant policy changes at least until parliamentary elections in October, when he will have a chance to build his party's numbers. Any changes Zelenskiy wants to make must also take into account external influence, including a push by the West for policy continuity on economic reforms tied to the country's financial assistance program through the International Monetary Fund. Beyond the immediate term, Zelenskiy could shift Ukraine's approach to key issues such as the conflict with Russia-backed separatists in Donbas. Indeed, he has called for a reset of the negotiation process over ending the war in Eastern Ukraine, but faces obstacles to that ambition. Ukraine's Western backers have pushed for a continuation of the Minsk process and Normandy format of negotiations, a step that Zelenskiy's representatives have confirmed a commitment to keeping, meaning the bid to find a resolution to the conflict will face the same constraints. U.S. Special Envoy to Ukraine Kurt Volker has called for direct talks between Ukrainian President-elect Volodymyr Zelenskiy and Russian President Vladimir Putin, UNIAN reported April 23. In the meantime, Zelensky's aides have announced plans to scrap immunity for members of parliament and increase the transparency of military equipment purchases.